Te Matatini 2015 – Christchurch will be held from 4 – 8 March 2015, North Hagley Park, Christchurch. The Hauora Village will be situated in the Te Matatini market place. The aim of the Hauora Village is to provide information and services that support Māori whānau to achieve active, positive and healthy lifestyles. 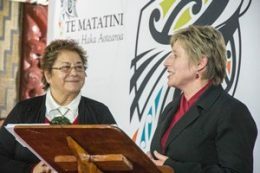 The Village will operate under the Te Pae Mahutonga indigenous framework and will advocate Mauriora (access to a secure cultural identity); Waiora (environmental protection); Toiora (healthy lifestyles); Te Oranga (participation in society); Ngā Manukura (leadership) and Te Mana Whakahaere (autonomy). The Hauora Village aims to deliver the following. We expect Hauora Village health providers to commit to providing the following to all festival participants. We expect that all services in the Hauora Village will be provided free of charge to festival participants. If you wish to charge for your services, you will need to register (and purchase) a stall space in the general market place from Te Matatini. Stall registrations can be found on www.tematatini.co.nz. Te Matatini is a whānau friendly, smoke, alcohol and drug free event. It is an opportunity for all people, regardless of culture, background or age to come together to share and celebrate the richness of Māori culture. If this sounds like you, we welcome you to register by downloading and returning the registration form or by contacting Gail McLauchlan on [email protected], phone 03 364 1777, mobile 027 512 6164. Monday 22nd October Stalls applications open. Application form and Terms & Conditions available online from this date. Friday 21st November Stalls applications close. Tuesday, 9th December Applicants advised. 20 January – 2 March Information provided to stallholders as required. 3 – 4 March Stallholder pack in and briefing. 4 – 8 March Te Matatini 2015 – Christchurch. 8 – 9 March Stallholder pack out. How can I apply for a stall at Te Matatini 2015 – Christchurch? The stalls application process opens on Monday 20 October 2014. Download a Hauora village registration form. What type of stall sites is available? Tents are 6m x 6m and will hold 3 to 4 trestle tables for each stallholder. Sites are available in the following sizes. What are the criteria for applying for a stall site? Deliver services in a uniquely southern way. Agree to the Stallholder Terms and Conditions. All applicants will be notified by Tuesday, 9th December 2014 on the outcome of their application. How will stalls be allocated? Stalls will be allocated to those applicants who meet the criteria. Can I see the Hauora Village map? A Hauora Village map will be available by January 2015. Can I choose my own stall site? No. Stall sites will be allocated at the discretion of the Hauora Village organizing team. Is there Wi-Fi access on site? Yes. There will be Wi-Fi on site. Details on how to access this will be given during pack in. Will there be power to the stall sites? Yes. All stalls will have one power connection to their site. No individual generators are to be brought on site. Do I have to set up the marquee? All stall sites come with a marquee tent that will be set up by Te Matatini. Do the marquees being supplied have walls and can they be fully secured and zipped up at night? Yes the tents have walls, and can be laced up/zipped at night. Security will be patrolling the site during, and after festival hours to minimise any security threat. Do I get any furniture with my site? Two chairs and a table are provided. You will have to provide any other equipment, flooring and furnishings. Can I hang any signage or banners on my tent? All marquees have soft walls and you are welcome to hang banners or signs on the tent. Can I use the Te Matatini brand on my products or signage? No. The use of the Te Matatini name, logo or brand on any product is strictly prohibited. Can I have additional passes for extra staff? What is the pack in and out times? Pack in and out details plus restocking times will be supplied to stallholders by 20 January 2015. Will water be available for stallholders? Yes a water supply will be available on site. Will there be lighting on site? Lighting will be on site for early mornings as stalls are being re-stocked and if required at night. It is expected that the kapa haka competition will finish while there is still sufficient daylight for stallholders. Will there be security on site? Twenty four hour security will be provided by Te Matatini. During festival hours, there will be general roving security. After hours there will also be roving security on site and gates will be locked from 8pm. Will there be support on site for stallholders and exhibitors? Yes. A Hauora Village liaison will be available on site from the day of pack in until pack out. What regulations should I be aware of? If you are going to provide food to festival participants you will need to ensure you are following best practice food hygiene and preparation. Please go online to www.foodsmart.govt.nz and www.foodsmart.govt.nz/producing-food-for- sale/overview/ for useful tips on food safety. Can food samples/giveaways be provided? Yes – However if you are providing food samples/giveaways at the Hauora Village, this must be approved by Te Matanini and not be in competition with food stallholder providers. Can I come to the pōwhiri? Yes. The pōwhiri will take place at 11am, 4 March 2015 on North Hagley Park. It is open to the public. You do not need a pass. However as a stall holder you will be part of the tangata whenua (home people) welcoming our manuhiri (visitors) and should arrive early. Can I take photographs of the stage? No. Photography and filming of the kapa haka on stage is prohibited, except by official Te Matatini photographers and broadcasters. Yes. There will be disability parking located close to the main gate entrance. What else is going on during the festival? Feel free to browse other information about the festival on www.tematatini.co.nz An Official Event Programme will be available for sale during the festival highlighting key activities occurring on site and profiling the kapa haka, MCs and Kaiwhiriwhiri (judges). With your help we can welcome and manaaki our manuhiri (guests), infuse our uniquely southern flavour into the festival, and, ensure everyone enjoys the very best festival we can offer. The volunteer workforce makes up approximately 25% of the entire festival workforce. We are looking for a workforce of 400 volunteers to help us welcome guests at the gate, look after kaumātua and VIPs, pick up rubbish, work in the car park, act as general information ambassadors, man the lost and found, help service the toilets, tend the whānau area, help install art works and raised gardens, decorate marquees and everything else in between. We have lots and lots of jobs. Can I choose what I want to volunteer for? On the registration form you will be given the option to nominate your preference. When will I hear what team I am in and what I am doing? Team leaders are being selected now. Part of their role is to contact the volunteers and confirm that you are okay to work in their team. How many days does the Festival run? Te Matatini 2015 – Christchurch will run for five (5) consecutive days from 4 – 8 March 2015. The first day is the pōwhiri, the following three days are made up of the preliminary competition pool rounds, with the finals being contested on the last day. Do I have to volunteer for all of them? We expect that you will volunteer for a minimum of two days or equivalent. Your team leader will work with you to schedule this. Will there be volunteer travel and accommodation provided? Is there a volunteer uniform? Yes, once you have been confirmed in a team your team leader will get you sorted. Will I be fed while I am volunteering? Do I need to buy a ticket to attend the festival if I am volunteering? If you are volunteering for a minimum of 2 days: no. If you are volunteering for less: yes. The minimum age is 14, however, conditions will apply. Do I get anything for volunteering? You will get some training, a uniform, a festival ticket, kai, lots of memories and stories and knowledge that you have contributed to a once in a generation event. If I need more information, who do I contact? 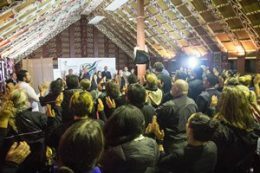 Rehua Marae was packed out last night for the much-anticipated Te Matatini 2015 National Kapa Haka Festival live pool draw for team performances. Waitaha Cultural Council chair Ranui Ngarimu said it was very exciting to be announcing the pool and order of performance for the 45 teams. Te Matatini Trust Board officials were in attendance along with Te Rūnanga o Ngāi Tahu Kaiwhakahaere Tā Mark Solomon and Christchurch Mayor Leanne Dalziel. Te Matatini Trust Board Te Kahautu Maxwell Mātaatua Delegate called the draw which was streamed live on the web and broadcast live from our very own Tahu FM. The much-anticipated draw for next year’s team performances at the National Kapa Haka Festival will take place at Rehua Marae in Christchurch on Wednesday 11 June at 7.30pm. The draw determines the order of performances for the 45 teams that will compete for the title of best performing Te Matatini Kapa Haka group when the festival is held in Otautahi-Christchurch from 4-8 March 2015. The festival attracts the best teams from all over New Zealand and Australia after qualifying through regional competitions. Te Matatini 2015 – Christchurch is produced by Te Matatini Kapa Haka Aotearoa, the national organisation responsible for fostering Kapa Haka and Māori performing arts in New Zealand. 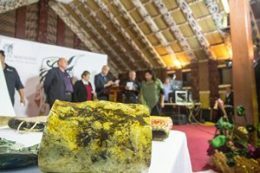 Next year’s competition is to be hosted by the Waitaha Cultural Council with support from the South Island iwi Te Rūnanga o Ngāi Tahu and the Christchurch City Council. Executive Director of Te Matatini, Mr Darrin Apanui, says tomorrow night’s draw has been eagerly anticipated by the teams. The order of performances is determined through a ballot, and is undertaken in the presence of members of the host committee. “All of our teams will be watching and waiting for tomorrow’s draw. They’re all very keen on knowing where in the festival they’ll be performing so they can prepare as best they can. Being first to perform at our festival can be a nerve-wracking challenge for even the most experienced kapa haka performers,” Darrin says. Te Matatini festivals attract thousands of people each day of the four-day festival, with more than 20,000 expected to converge on the Christchurch venue for the semi-finals and finals. The festival itself will be broadcast on television and radio, as well as online, which makes the uniquely Māori performance art available to a global audience. Te Matatini 2015 will be one of a number of major events to be held in Christchurch next year. Selwyn Parata, Chairman of Te Matatini, says: “We are excited about holding our next biennial festival in Otautahi. It has been a number of years since it was last held in Te Wai Pounamu and we’re looking forward to playing our part in helping rebuild the cultural vibrancy of the city. The full draw will be published on Te Matatini’s website www.tematatini.co.nz after the draw. Good luck to all competing in the Waitaha Secondary Schools Competition today. Each session is $6 per ticket. Children under 5 free (if sitting on knee).